The Guthrie Theater presents A Christmas Carol every year, and this is the sixth year in a row that I've seen it. They've been using the same adaptation for years, although last year was a condensed 90 minute version of it. This year they're using a brand new adaptation by Crispin Whittell, directed by Guthrie Artistic Director Joe Dowling. The old version was great, but after so many years you know what's going to happen when, so it was a lot of fun to see a new twist on the classic story. This version seems a little crisper, a little more modern. There's no narrator like in years past, and it's a little funnier too. The set is entirely new and features Scrooge's office with a safe full of money and a loft upstairs, from which he watches some of the action. The ghosts fly in on wires, Christmas Past was right over my head! One thing that hasn't changed about A Christmas Carol is that it features a great cast. Guthrie favorites include Isabell Monk O'Connor, Nathaniel Fuller, Suzanne Warmanen, Hugh Kennedy, and the brothers Nelson. Kris plays Scrooge's clerk Bob Cratchit and Mark plays Marley's ghost in chains and gray face paint. Mark's daughter Ella is one of the children in the cast, who were all wonderful. I've seen quite a few productions with great child actors lately (Joseph, Billy Elliot), and I realized today that I shouldn't be surprised that kids are great actors. All kids love to play make-believe, and kids are much more open and imaginative than adults, so it's no surprise that some of them thrive on stage. This year's younger and heartier Ebenezer Scrooge is Daniel Gerroll (another theater actor with dozens of TV credits) in his second role at the Guthrie. His dark wit and singular focus on making money believably transform into an openness and joy at life after witnessing his past and what's waiting for him in the future. Angela Timberman is very entertaining as his drunken housekeeper Merriweather who's startled at his change in demeanor. Nic Few plays the Ghost of Christmas Present with joyous energy and laughter that's contagious. The streets of London and Fezziwig's party are populated with dozens of men, women, and children who laugh, dance, and sing. I was sitting in the front row and felt like I was at a great party! 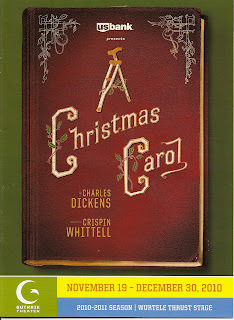 I enjoy A Christmas Carol every year and was delighted at this fresh new take on it. 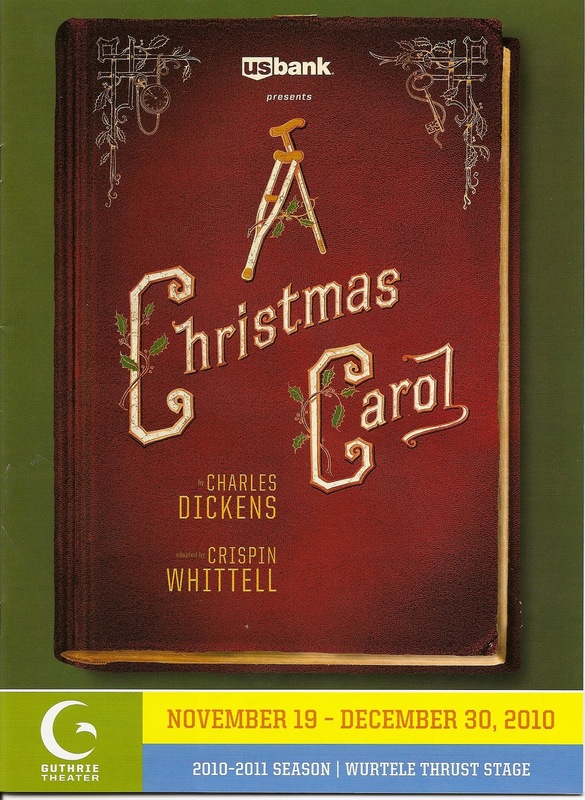 Sets, costumes, and staging are always incomparable at the Guthrie, but it's the heart of the story embodied through the excellent cast, from Scrooge down to Tiny Tim, that make this a memorable show.